A necessary replacement as my previous shifters had worn out. These are basically the same. A good product. 105 levers are a great "work horse" product - gears shift smoothly and accurately. Little difference between the 105 and more expensive levers in weight. Got these STI's for my winter bike and love them! They have an awesome crisp feel and the supplied cables are very smooth. I am looking to buy a complete 105 groupset for another bike after trying these. Bought these to run on my rain bike, much needed here in the NW USA. These are very rugged and work great even in the wet weather. Merlin had a great price and got them to me quickly. Love the service, keep it up please. Purchased as a cleaner looking upgrade than my well-loved Tiagra shifters on my CX/Daily/all-around-adventure bike. They have the grip and response of more expensive shifters with the same clean cable routing. You'd expect the price or the weight to be greater. Bottom line: these are the best levers for the money I've found, fantastic. I am a 105 user but had damaged the shifters. This new model is slicker and easier to use and the new coated cables are slick. The fitting and cable routes are a little different and the Shimano notes are not brilliant (as ever) but still a great product! Totally changed the way I ride. I had Sora shifters with thumb buttons before, couldn't shift from the drops. These are unreal...so silky smooth and responsive. Thanks Merlin! Bought these to replace my 4 yr old 105 levers. Noticeable improvement in shifting and braking. Do exactly what I would expect from shimano, flawless use, smooth precise action, and hand position is good whether on the drops or on the hoods. Excellent product. Great brake and gear shifters, good enough to race with! A great set of dual control levers. It is a bit awkward inserting the gear cables. But worthwhile doing, as this design lets means the cable is routed along the handlebar and hidden by the bar tape. Had the new style Sora levers on my new bike but the Front Mech was a long shift before it engaged. As I live in South Devon I ride a lot of hills and need to change gear alot as well as need some solid brakes. I was getting a bit of cramp on long descents when trying to keep the power on. So changing to these 105's has been fantastic - the changing is smooth as butter which makes the hills a breeze and then the power is effortless when you descend. The most positive thing is the price from Merlins, it made the upgrade properly possible. Excellent sharp and easy shifting, bought as a replacement after the failure of well known American suppliers product. Bought these to replace a set of original 105 levers that had broken after 15,000 miles. They are a great improvement giving a much better change both up and down and the revised cable layout gives a much neater look. Fitting was straightforward and took me about 2 hours and indexing the gears was surprisingly simple. If you want some shift/brake units for drop bars, these are tip top. Solid, reliable, shift and brake from the drops, nice. Tried ultegra but they were too dear. Tried tiagra but they were a bit plasticky. If you like sram or campag maybe theres other options... Hey, you could always run fixed too if thats your bag... But if it is why are you reading this? Purchased for my new winter training build. Good build quality and nice smooth change, a huge improvement in braking vs my previous 2300 . The usual fast delivery and exemplary service from Merlin. Excellent levers and the pack included everything you need to complete the job. Levers very good, had Tiagra models and noticed a nice difference, even if the Tiagra were softer in trade and ergonomics were better at fitting the hands but these 105 exchanges are much more accurate and faster, thanks merlin great company fast shipping. Huge improvement on my old Tiagra levers, the hidden cables look great and they shift amazingly. 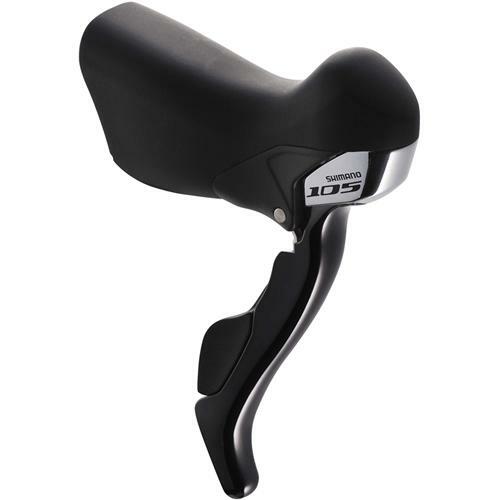 Cheapst 105 shifters I could find. Upgrading from Sora shifters so the difference is instantly noticable. Very comfy on long rides. Changing into the larger sprockets is so easy with very little force required at all. All working perfectly. Braking performance has also significantly improved (same calipers). Great purchase great price and great service from Merlin. Ordered Friday, arrived Saturday. Perfect!! Not much to say but the levers are great. I upgraded my intro level bike which had 'shimano integrated' levers to these ones (along with the rest of the grouspet) and the difference is incredible, only had them on about a week now but they were a great uprade and I won't be looking back! Plus the black is nice! Bought these to upgrade from the old Shimano 105 5600 shifters - Merlin were by far the cheapest - and the price includes all outer and inner gear and brake cables. Research I did beforehand raised concerns about compatibility with the old 5600 brakes and front derailleur but this wasn't an issue, they work perfectly, and the under tape routing of the gear cables gives a much cleaner look. Amazing levers and a super cheap price, very very satisfied with the service and the levers. I bought them because of the under bar cable routing but they are so much smoother than my Tiagra shifters I'm glad I made the upgrade. Highly recommended! Great value and prompt dispatch from Merlin. Excellent service. Brilliant product, good price and a good company to deal with. Excellent Service and Pricing (yet again) by Merlin. Much better than the other big online cycle retailers. I use Shimano 105 on my commute bike. Having put in almost 20k miles on the old 5600 105 brifters I had no complaints or worries with going for the 5700 brifters. Having installed them myself (it was that easy), they work great and the clutter free cockpit with brake and gear cables under the bar tape is a vast improvement and definitely recommendable. I upgrade from 9-speed to 10-speed, changing the triple crank to double one. That causes me to change everything. I must have spent more money, but here "Merlin" gave me good prices. Thanks so much, Merlin!! Next time again I will definitely come and buy some, I swear. I was lucky I found this nice internet shopping. Thanks. Came the next day, and all at a bargain price. Gear changes are crisp and smooth. Would highly recommend. Shimano 105 5700 upgrade is incredible. I went from Sora 9 speed to 105 and its a totally different ride. Shifts on demand, sora can be a finicky, and brakes stop on a dime.